Triple strand freshwater pearl necklace, made with 6-7mm Round white freshwater cultured pearls,ended with a sterling silver clasp. The wearing length is 17inches to 19inches. Freshwater pearls are valued for their vivid colors, unusual shapes and large sizes. These pearls are of good luster, smooth surface and fine quality.We hand knotted between each pearls for security and safety. These pearls are so breathtaking that they grab the attention of everyone in the room. 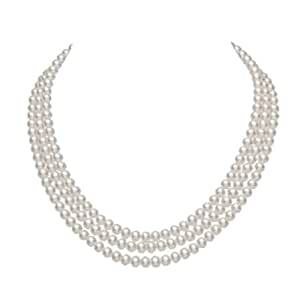 Classic round pearls make a stylish addition to your jewelry collection. We support Pearl Customization. Any question or request on our pearls quality, size, setting, metal type, please feel free to contact us, we are always here to help you.